There are many beautiful choices for those considering new floors as a part of a new build or renovation. Hardwood flooring is a standard choice for inside and outside floor replacement projects, but it is not always the best choice. Often quality decorative concrete is a wiser choice for your floors. One of the great misconceptions about decorative concrete floors happens when people underestimate the importance of the word decorative. With today’s technical advances, if you can dream up a design, it is highly likely that we can create it. 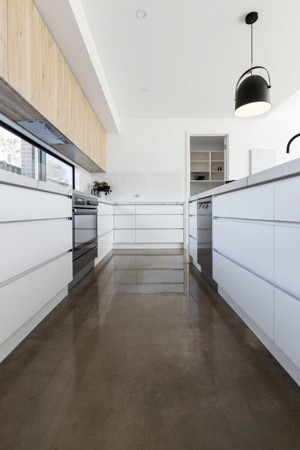 This creative flexibility appears when it comes to installing concrete floors. You have the option to choose the type of stones, colour, and finish of the decorative concrete flooring. We can match or coordinate colours to give you the perfect base for your decor. Customers love this because they have access to the look of rare or unusual floors without the hassle of finding a specific type of wood. Decorative concrete is an exceptionally versatile flooring choice. It lends itself perfectly to all settings and decorative styles. 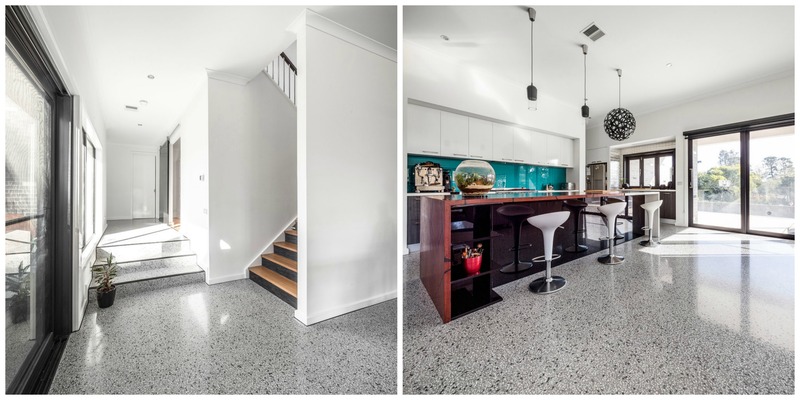 The concrete flooring works equally well inside every room of your home, in sunrooms or alfresco areas, and as a deck around pools or gardens. Anyplace you would like the look of hardwood flooring you can enjoy decorative concrete flooring. Many customers are surprised to find that installing decorative concrete floors has some healthy side effects. The sealed concrete surface will not collect allergens, dust mites, and bacteria the way porous surfaces or carpeting can. These floors are moisture resistant, so mould and mildew will not grow and contaminate your home. This benefit is especially significant if allergens, moulds, and mildews could compromise the breathing or overall health of someone in your household. Decorative concrete is also a safe surface for your family and friends, especially young children. As a part of our installation process, we can mix a fine grit into the material before we pour it. While the grit is not visible, it helps ensure traction and prevent slipping even when the surface is wet. Hardwood floors are famously high maintenance. For a brilliant looking hardwood floor, you need special cleaners, routine stripping and refinishing, and wood repairs as required. Additionally, wood flooring is prone to splintering, cracking, and fading over time; especially if the wood is outdoors and exposed to the elements. By contrast, decorative concrete needs minimal care. If the surface is outdoors, you can use a hose to wash away any dirt or debris. Indoors, a damp mop will clean the concrete as a part of your home’s regular upkeep. If you would like extra protection for the decorative concrete flooring in high-traffic areas, a thin coat of floor wax will work well. With a concrete floor, you are free from concern about the structural integrity of your surfaces no matter what they endure. Decorative concrete flooring can save you a considerable amount of money over the cost of hardwood floors. You can even save approximately $1.00 per square foot each year on cleaning supplies with a concrete floor. As you can see, there are plenty of good reasons to choose decorative concrete for your next flooring project. Aesthetics are an essential consideration for every remodelling project. However, other factors such as durability, maintenance, versatility, cost, and sustainability all play important parts in your choice of flooring material.